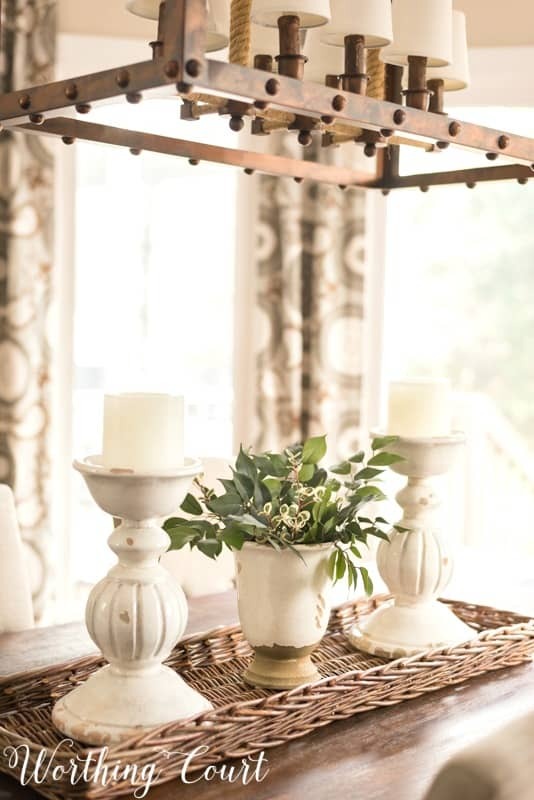 Raise your hand if your favorite way to create a spring centerpiece is to flank a floral arrangement with a couple of candlesticks and call it done. In case you can’t see, I’m standing over here furiously waving both of my hands in the air! I get it – it’s simple and easy and with the improved look of faux florals, there’s no need to feel like you have to use real cut flowers. Now, there’s nothing in the world wrong with that, but I’m here to encourage you to try something a little different. Stretch those creative muscles in your mind and do the unexpected. Raid your stash and pull out things you would never ever think belong in a centerpiece. That doesn’t mean that you shouldn’t use flowers in your spring centerpiece. What it does mean is that I hope you’ll try adding something unexpected along with the flowers. Let’s take a look at a few ideas that you can copy. 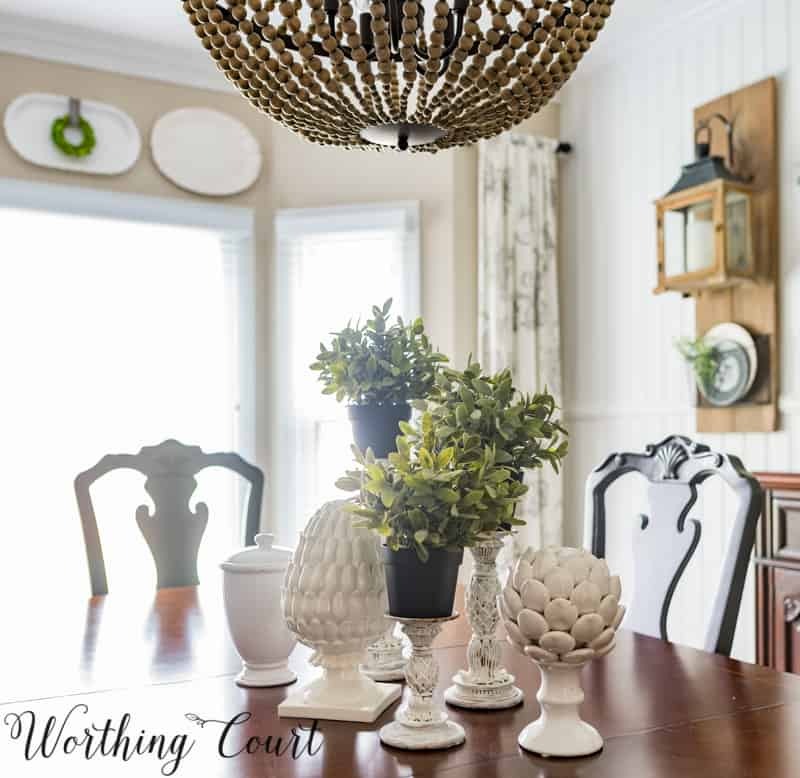 This spring centerpiece in my dining room has a simple green and white theme. Yes, there are candlesticks, but look ma – no candles. Instead of topping my candlesticks with what you expect to see there, I did the unexpected and topped them with faux potted plants. 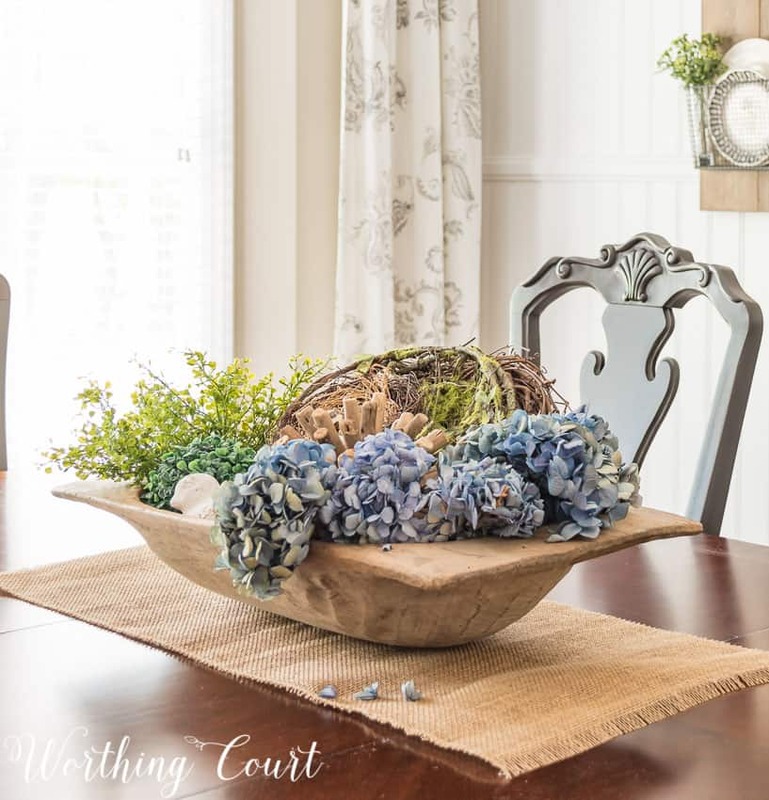 A lidded urn (that is really meant for a bathroom), a white pineapple and a ceramic artichoke complete the centerpiece. So easy and so different! Here’s another green and white themed spring centerpiece. And yes, it has the typical candlesticks flanked by a floral/greenery centerpiece. So, what’s unexpected about it then? In my book, it’s the size of the candlesticks. They are much chunkier than the daintier candlesticks that are often paired with a vase of flowers and that’s something that you don’t normally see. Here’s one that’s totally outside of the box – a large dough bowl filled with all things springy and not a candlestick in sight! Notice that I have it placed on a piece of burlap to help give it a grounded look. Not sure how to layer and fill a large doughbowl or basket? Click HERE for my step-by-step directions. And finally, here’s one last spring centerpiece that contains a bit of the unexpected. Once again, I have everything corralled on a tray since there are so many different parts. 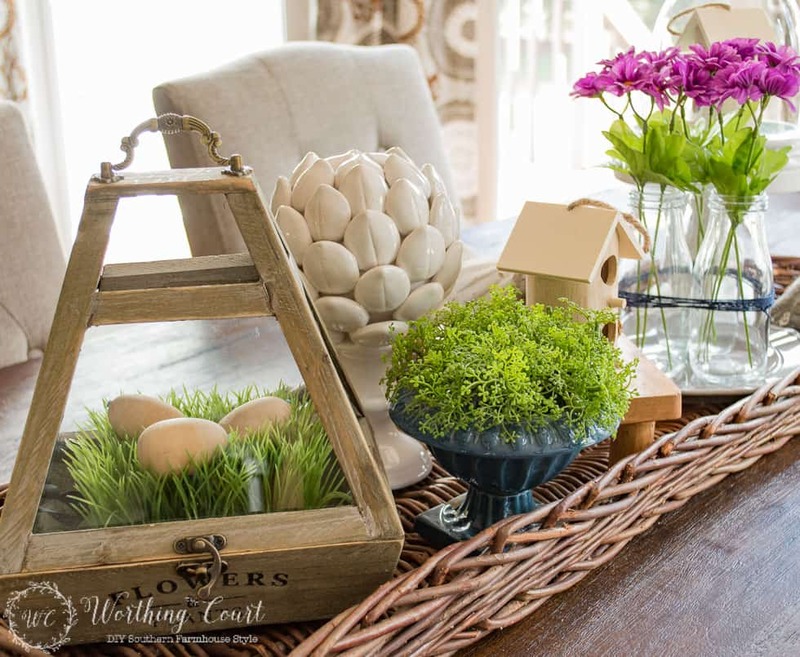 And yes there are the obligatory flowers present, but there’s also a mini terrarium filled with grass and wooden eggs, a mossy urn, birdhouses and more – lots of things you wouldn’t normally expect to see in a centerpiece. 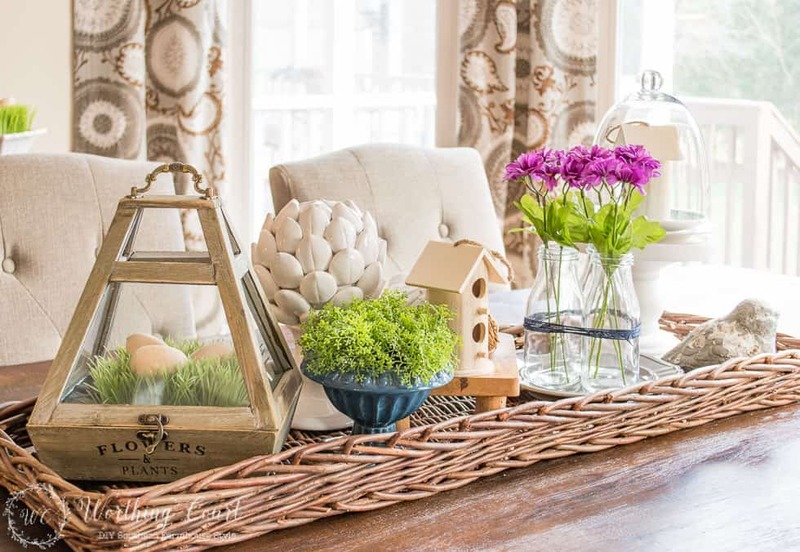 I hope these outside-of-the-box centerpieces have sparked your creative juices when it comes to freshening up your home this spring! I love all your tips and ideas! I’m on the hunt right now for an affordable dough bowl that I like. I really want something that looks like it came from by the sea since that’s my style. I also saw in your photo that you ha d a small lantern. I saw something similar in Home Goods and I think I have to go and get it! Thanks for sharing! Either way they are inspiring and beautiful! All of your centerpieces are amazing! You have a true talent for creating centerpieces. Thanks for the inspiration! 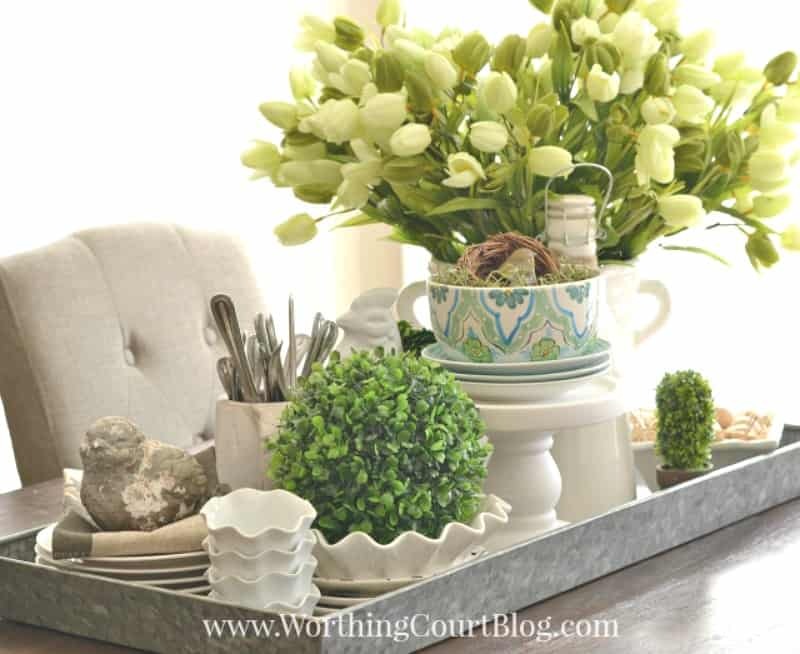 My favorite is the huge bunch of tulips along with the greenery’s in the galvanized tray! It just says spring to me! Great ideas and hard to choose a favorite! Thanks! Wow! I love all of your vignettes. Great inspiration! 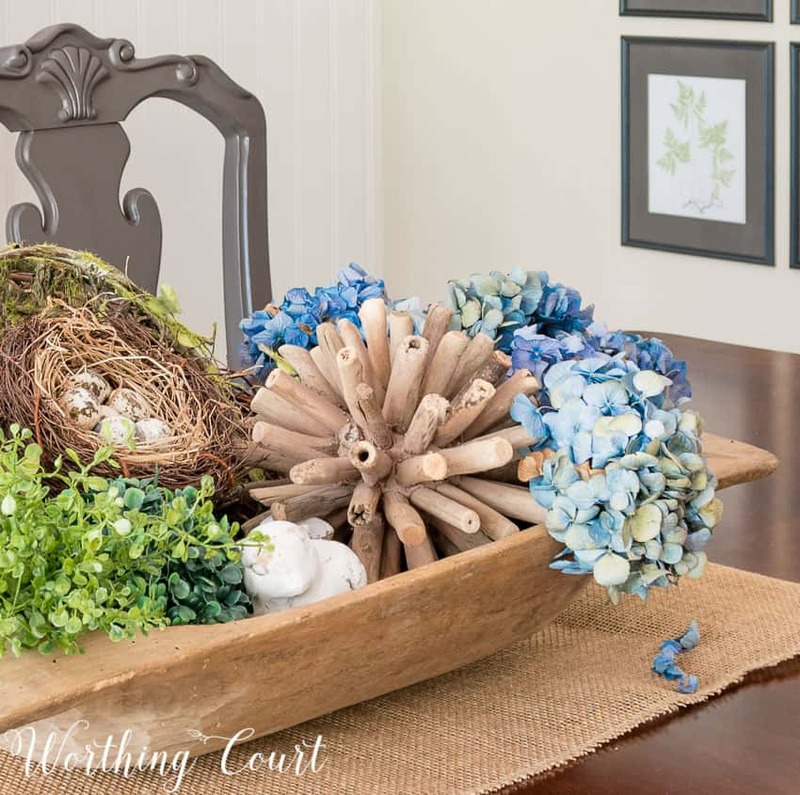 You always make/have the best centerpieces/vignettes! Love them all!!! I love your inspirations. Thank you so much. Beautiful! Where do you get your tulips? I love all your seasonal ideas! You inspire me, pick me up, and motivate me! 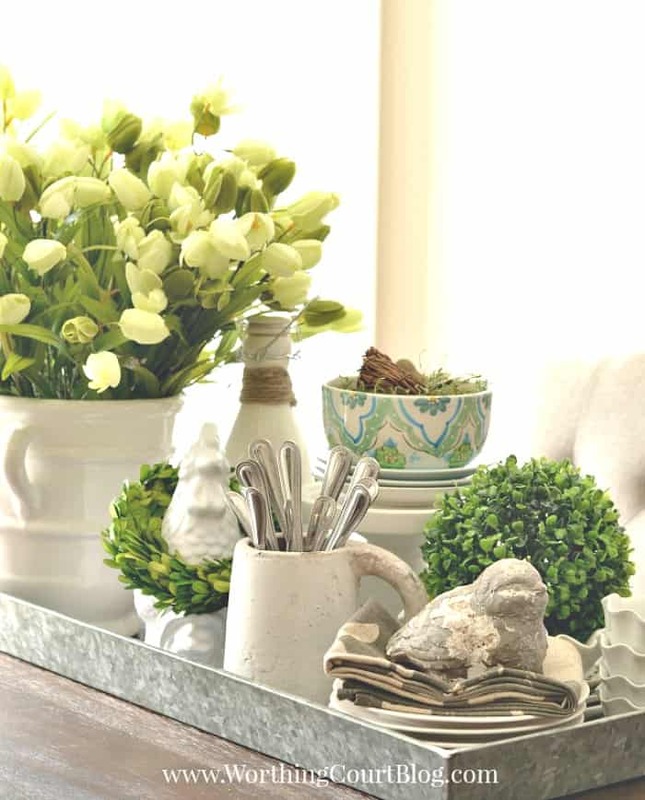 Love these, Suzy… the hydrangea is my fave! Pretty, pretty, pretty—every one! I love that little bird sitting on the napkins in the top vignette. All of the centerpieces are creative and fun to look at.